It's like getting a multi-vitamin, protein powder, greens drink and immune booster — all rolled into one. If you're like me, you pride yourself on a healthy diet and lifestyle. And you take nutritional supplements each day to make sure you're getting all the vitamins and minerals you need. As good as these supplements are, there's a limit to how many you can take each day. ... without taking a single pill or capsule? And imagine if this new approach was so much more effective than what you're doing now—you could actually feel the difference fast. That would be a breakthrough for your health, wouldn't it? Well, I'm pleased to tell you that this breakthrough does exist, and it's easy and delicious. Dr. Frank Shallenberger has been a practicing medical doctor for over 35 years. He is the founder and medical director of the Nevada Center for Complementary Medicine. He is a past president of the Nevada State Homeopathic and Integrative Medicine Association, and has served as a Clinical Instructor in Family Medicine at the University of California School of Medicine in Davis, California. He is also the Editor-in-Chief of Second Opinion newsletter. Dr. Shallenberger has published numerous scientific papers and is the author of two books: Bursting With Energy and The Type 2 Diabetes Breakthrough. He is the originator of Bio-Energy TestingTM, CheZone and ProlozoneTM Therapy and has trained over 700 doctors in the use of these techniques. Instead of having supplements compressed into tablets and capsules, I decided to keep them in powder form. That way they could be mixed into a glass of water, juice or a smoothie. I started making this supplement powder only for my private patients. For years, we used it right here at our clinic. And the feedback I got from patients was amazing. Many patients told me they noticed improvements in their health even though this nutrient powder was the only thing they were taking. So I kept working on the formula and improving it, until I found a mix of ingredients that really worked like gangbusters. Once that happened, patients started coming to the clinic and buying it by the case. They told me "I'm sending some to my brother" or "I'm sending some to my aunt." That's when I realized that many more people, besides my patients, could benefit from this special nutrient powder. You see, a regular-sized vitamin capsule can only hold about 800 mg to 1,000 mg (1 gram) of nutrients. 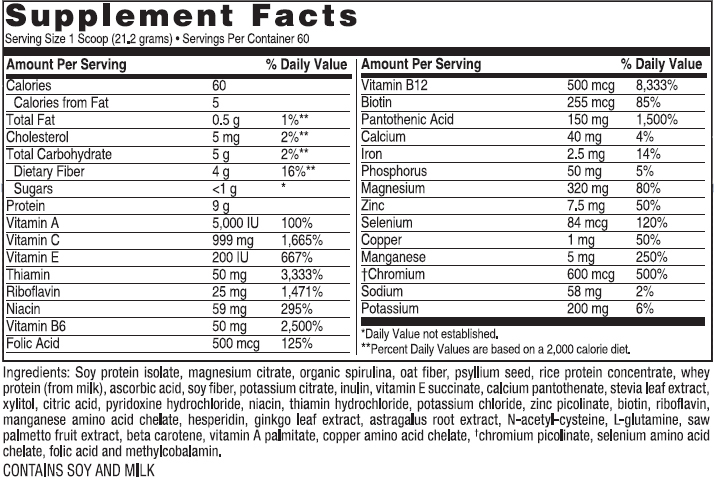 But two scoops (the daily dose) of Super Immune QuickStart powder contains 40 full grams of nutrients. That means it would take up to 40 large-sized capsules to pack the same amount of nutrients found in a single daily dose of Super Immune QuickStart! 1 First, you get a full dose of all the vitamins, minerals, and anti-oxidants you need on a daily basis. Super Immune QuickStart gives you a whopping 22 different vitamins, minerals and antioxidants. From vitamin A to zinc. Full therapeutic doses, not just "window dressing"
Click here to start benefiting from all the powerful ingredients packed into Super Immune QuickStart. Or call toll-free 1-800-791-3395 to order your supply. 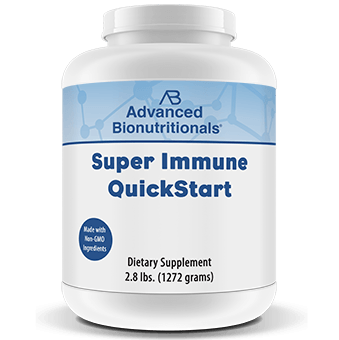 Unlike other supplements that just add tiny amounts of nutrients to make the label look good, Super Immune QuickStart includes full therapeutic doses. That means it delivers each nutrient at the same dosage level as the clinical research studies I used to formulate Super Immune QuickStart. If you look at many multivitamins, they have miniscule amounts of nutrients. Like 5 mcg. of selenium. Super Immune QuickStart, on the other hand, delivers a whopping 168 mcg. of selenium per day. That's 33 times more! Dosage is a big deal in medicine and one that's often overlooked. Especially when it comes to vitamins and herbs. 2 You get the natural detoxifying power of psyllium, n-acetyl cysteine, l-glutamine, and organic spirulina. Toxins are in our food, our water, in the air we breathe, cosmetics and personal care products, and on surfaces we touch. I've come to the conclusion that you can't completely avoid toxins. So don't drive yourself crazy about it. Instead, arm your liver and kidneys with the nutrients they need to limit these toxins. That's why Super Immune QuickStart focuses on detoxification and liver support. Starting with psyllium seed, a dietary fiber that acts as a natural laxative to help expel toxins and waste from your body. And there's organic spirolina, a natural sea algae that's packed with protein, vitamins and phytonutrients. Spirulina feeds your intestinal flora, to help your digestion and decrease infections. 3 The immune-boosting strength of astragalus and hydrolized whey protein. 4 The pH-balancing activity of potassium, calcium, and spirulina. As you may know, your body produces acid. You take in oxygen and nutrients and make waste products like acid. You can measure this acid level by using special test strips and testing your urine in the morning. These test strips measure your "pH balance" - the amount of acidity in your body. A pH value of 7.0 is considered neutral. A pH value that's slightly acidic, between 6.5 and 6.8, is considered ideal for good health. But what if your pH dips below that? That means your body is too acidic. And a body that's too acidic "puts out the welcome mat" for health problems. Bacteria, viruses, molds, yeast and fungus all thrive in an acidic environment. So do abnormally-growing cells. "My patients love taking Super Immune QuickStart..."
"... surprised by the additional energy and mental focus..."
"After being ill for some time, I visited Dr. Shallenberger. He fixed me up and got me started on Super Immune QuickStart. I understand Super Immune QuickStart is a vitamin/mineral supplement that aids in detox and strengthens my immune system. The product is worth the price for just those reasons plus it's easier and more cost effective than trying to create the same benefits from a ton of individual products. In addition, I was surprised by the additional energy, mental focus and appetite control I experience when using Super Immune QuickStart. If you're only willing to commit to one product, this is the one. I whole-heartedly recommend Super Immune QuickStart to everyone." "... so easy and enjoyable to get the right nutrients daily..."
"Since we learned about it about a year-and-a-half ago, we completely changed over from our extensive supplement regimen to the convenient 2 scoops of Super Immune QuickStart daily and feel absolutely great. Instead of counting and managing an X-amount of pills, Super Immune QuickStart makes it so easy and enjoyable to get all the right nutrients daily. We like to add it to our protein shakes, breakfast cereals or simply mixed into water or yogurt." "... sinuses cleared up completely..."
"I started the orange flavor Super Immune QuickStart (about a week ago or so), anyway my sinuses cleared up completely by day 3 or so. Simply amazing." However, a pH-balanced body helps your immune system clear out germs and infections before they can fester. That's why Super Immune QuickStart is packed with minerals and nutrients to help balance the pH in your body. These include potassium, calcium, and spirulina. 5 Support for your heart and healthy blood sugar. Chromium, for example, has been shown to lower fasting blood glucose.13 It even boosts the number of insulin receptors on your cells14 to increase insulin sensitivity. And it helps reduce the risk of more serious blood sugar dangers. Super Immune QuickStart contains a whopping 1,200 mcg. of chromium in each daily dose. That's much more than you'll find in other multi-vitamins. 6 The extra protein you need for muscle strength and balance. Your body craves protein for building muscles, organs, bones, connective tissues, and for healing faster after a workout or an injury. But did you know that protein forms antibodies that protect you from viruses and bacteria, too? It's true! So by ramping up your daily intake of protein, you can improve your immune system, strengthen your muscles and bones, and help maintain a lean, fit body that's less prone to falls. That's why Super Immune QuickStart contains a special blend of protein made from whey, spirulina, rice, and soy proteins. Super Immune QuickStart also gives you therapeutic doses of saw palmetto and soy isolates, which have been shown to enhance immunity. Saw palmetto also helps regulate both male and female hormones, to support prostate and breast health. 8 PLUS, extra fiber to improve digestion, immunity and weight control. You probably know that fiber helps fill you up, so you don't reach for snacks as often. Yet it does a lot more than that. Fiber can dampen your cravings for fattening foods. It may even block the absorption of calories. In one study, people who ate just 14 extra grams of fiber a day automatically consumed 10 percent fewer calories per day—without even trying to diet! And without watching their portion sizes, either. Fiber also boosts your immunity. Studies show a high-fiber diet made white blood cells stronger and more effective disease fighters. Fiber also nourishes the immunity-boosting bacteria in your gut. So you can fight off colds, flu and infections better. All in one delicious, easy-to-mix "tonic"
You can mix Super Immune QuickStart into almost anything. Most of my patients simply stir it into a glass of water and drink it as a "tonic" twice a day. It has only 60 calories per scoop and has a slightly sweet taste (but not too sweet). And a slight greens flavor. In fact, you'll probably find it tastier and easier to drink than any greens drink you've ever tried. When you get a bruise, your body heals it. When you get a cut on your skin, your body heals it. When you get a broken bone, your body heals it. It's all part of your body's natural cycle of renewal ... where old cells die and new ones are born. But did you know that every cell in your body (except nerve and brain cells) reproduces itself every 3 months? It's true. That means every 3 months, you get a chance to have a brand new body! And if these new cells are bathed in all the healthy nutrients found in Super Immune QuickStart, guess what happens? They can be even stronger and healthier than the "parent" cells that created them. Click here for the easiest way to get more vitamins, minerals and nutrients — for a healthier body. And Xylitol tastes just like sugar but has 40% fewer calories. Xylitol even has antibacterial effects that fight gum problems and sinus and ear infections. Wow! You can actually feel Super Immune QuickStart working! When was the last time you tried a natural supplement and felt it working right away? Well, that's another big surprise with Super Immune QuickStart. When you first start taking Super Immune QuickStart, you may experience a warm, tingling sensation on your face or neck. Don't be alarmed. This is just a cleansing reaction from the niacin in the formula. Niacin is a gentle "vaso-dilator." That means it opens up blood vessels throughout your body to improve circulation.16 The tingling sensation from niacin goes away as you continue to use Super Immune QuickStart. Super Immune QuickStart is quite strong so it may take you a few days to get used to it. Start with a half scoop or less. Try Super Immune QuickStart as a "power breakfast." Then have another scoop in the afternoon for adrenal support. Once you feel the boost in energy, you'll love this afternoon pick-me-up! Ingredients: Soy protein isolate, soy fiber, magnesium citrate, organic spirulina, oat fiber, psylium seed, rice protein concentrate, whey protein (from milk), ascorbic acid, potassium citrate, inulin, vitamin E suucinate, calcium pantothenate, stevia leaf extract, xylitol, citric acid, pyridoxine hydrochloride, niacin, thiamin hydrochloride, potassium chloride, zinc picolinate, riboflavin, manganese amino acid chelate, vitamin A palmitate, beta carotene, hesperidin, ginkgo leaf extract, astragalus root extract, N-acetyl-cysteine, L-glutamine, saw palmetto berry extract, copper amino acid chelate, chromium picolinate, selenium amino acid chelate, folic acid, methylcobalamin, biotin. So there you have it—a powerhouse of nearly four dozen vitamins, minerals, antioxidants, detoxifiers, and immune-boosters in one formula. And you can get them all without having to gulp a single pill! It saves you a LOT of trouble and money. If you tried to buy all these nutrients separately, you'd have a cupboard full of bottles. You'd have to swallow up to 40 horse-sized capsules each day to get the same amount of nutrients found in one regular dose of Super Immune QuickStart. And if you purchased them separately, the same ingredients in a one-month supply of Super Immune QuickStart would set you back at least $163. But you don't have to pay anything close to that. Because Super Immune QuickStart sells for only $69.95 for a whole month's supply. That's a savings of more than $93! And for even better savings, order the six-month supply for as little as $57.95 per bottle. ... or if you decide you don't like it for any reason whatsoever, just send the empty jar back. You'll receive a 100% refund of every penny you paid - including shipping and handling. You only pay return shipping. Advanced Bionutritionals will even refund your money if you've finished the entire container. That's their famous "Down-to-the-Last-Scoop" guarantee within 90 days of your purchase. Simply click here for your Introductory Order of Super Immune QuickStart. Or call toll-free at 1-800-791-3395 any time 24 hours a day, seven days a week. Once they receive your order, they'll rush Super Immune QuickStart to your door. Since you risk absolutely nothing, why not order some today? What a healthy way to start your day! Imagine how great you will feel getting all the vitamins, minerals and nutrients you need—without having to choke down fistfuls of pills. Imagine getting all this supplementary nutrition, detoxification and immune support in one simple daily "tonic." And imagine the peace of mind of knowing that you are not only getting all these nutrients—but absorbing more of them, too. Like so many of my patients, you may discover that your health problems ease off or even disappear completely once you ramp up your daily nutrition with Super Immune QuickStart. That's why I urge you to order your supply of Super Immune QuickStart formula today. Click here to order right now. Or call toll-free at 1-800-791-3395 (24 hours a day, 7 days a week) and we'll rush you a supply. One thing's for sure Super Immune QuickStart will add a "rocket launch" of energy and vitality to your day. Enjoy! P.S. Click here or call toll-free 1-800-791-3395 to get many times more vitamins, minerals and nutrients than you are now—without swallowing a single pill. And remember, you can try Super Immune QuickStart risk-free thanks to a "Down-to-the-Last Scoop" Guarantee. Ask for your trial order today! ACT NOW! Order Your Super Immune Quickstart Today!